The Masdar Institute of Science and Technology (MIST), was the first part of the carbon-neutral citadel Masdar City to be built. Internal combustion motor vehicles are not allowed to enter Masdar City therefore, a pollution free transport system was needed. Systematica, together with Foster and Partners proposed the Personal Rapid Transit (PRT): a system of automated taxis running on exclusive guideways under the city. For the MIST connection, Systematica designed a route that linked the University building with a remote car park. This route was meant to be the first part of a city-wide network that would encompass the entire built area of Masdar City. Systematica modelled the movement of the vehicles in detail, assessing the level of service offered, formation of queues at stations, energy usage, dynamics of the vehicle and passenger comfort, consistency of the fleet, response to special events. For this task, a specific model was developed with the assistance of the University of Bologna. For this project, Systematica also wrote the technical requirements for the tender that was issued to choose the PRT technology; designed the routes and the vehicle-side of the stations, respecting the swept areas of the vehicles, the dynamic requirements for a smooth and comfortable movement; assisted the supplier of the technology to integrate their product with the infrastructure. 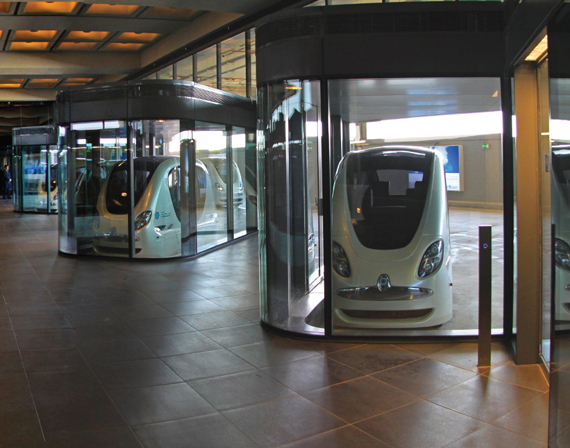 A Personal Rapid Transit (PRT) system with automated taxis is designed to run on exclusive guideways underground in Masdar. PRT routes, technical requirements and vehicles technology are proposed by Systematica that assessed also the overall level of service of the PRT system.